Don't miss your chance to be part of a night in Big Brothers Big Sisters of Colorado's History! Purchase your tickets today! We are turning 100 and looking to engage, celebrate and inspire past, present and future Bigs, Littles, Families, Donors and Board Members. 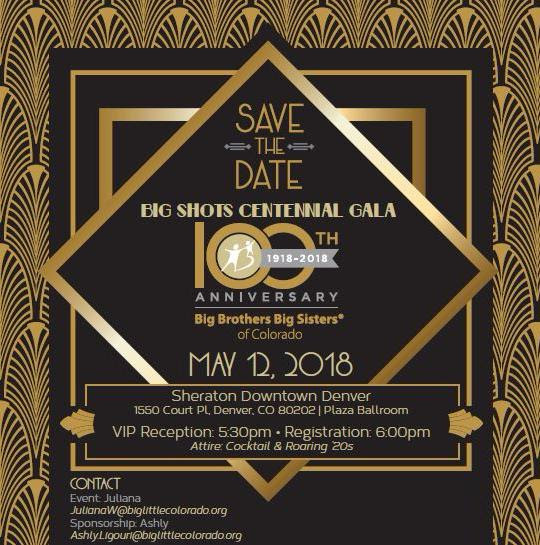 Please join us for a roaring ‘20s good time at our Big Shots Centennial Gala on Saturday, May 12 at the Sheraton Downtown Denver. The event will feature Bigs and Littles, robust silent and live auctions, dinner program, and entertainment.